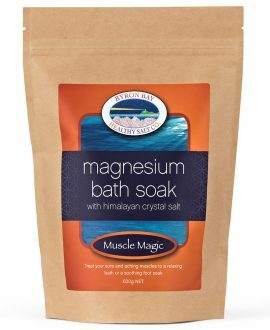 Magnesium Oil & Bath Salts | Byron Bay Healthy Salt Co.
to relieve muscle aches and pains. Recharge with a relaxing bath soak containing 100% pure essential oils. 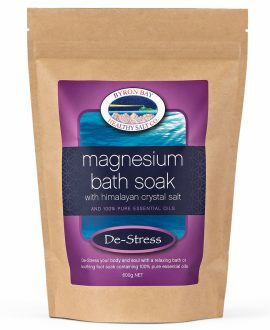 Indulge yourself and let the magnesium relax the muscles and our special essential oil blend soak the stress and tension away. 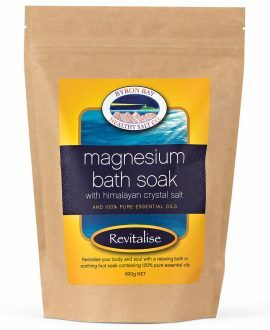 Himalayan Bath Salts, Foot Soaks, Magnesium Oil Spray and Magnesium Moisturiser. Relax & Destress your mind, body and soul with our range of luxurious, pampering Himalayan Bath Salts, Foot Soaks, Magnesium Oil and Body Moisturiser – all complete with our Magnesium & Himalayan Crystal Salt and essential oils. Our products soothe aching muscles while nourishing and revitalizing the skin. Our new Magnesium Oil Spray is a convenient and easy way to soothe sore and aching muscles while replenishing the vital magnesium supplies that our bodies crave. Mineral Salts are naturally occurring inorganic salts found in the earth and oceans. They need to be ingested or absorbed by the body for healthy growth and maintenance. Created by mother nature to sustain all living organisms. Simply put.. no mineral salt…no life. We have created a range of products to assist you in maintaining mineral salt levels. Whether you are an overworked, stressed or tired parent, love your sports and you play hard, our products will soothe your mood, relax your aching muscles and enhance your wellbeing.